Learn and experience up close with us at a local medical facility in Costa Rica. Gain medical experience while learning from friendly and professional doctors and paramedics. Shadow and volunteer under the supervision of well-trained medical professionals. 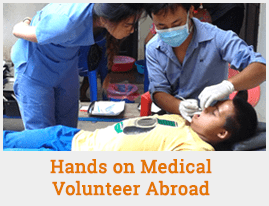 This placement gives volunteers an opportunity to experience how being a medical professional would be, while also expanding their knowledge of the field through a hands on experience. Volunteers help from the moment a patient arrives by greeting them in a professional manner, filling their charts with medical history and current medical problem, taking their stats and vital signs, and more depending on the emergencies and patients that come in that day. Tasks are usually based on the participant’s experience, studies, and capacity to learn. Qualified volunteers will also have the chance to assist the paramedics and ride in the ambulance in the case of emergencies with the first response paramedic team. Participants must be at least 18 years of age. This program is for participants that are staying 2 weeks or longer. Participants are expected to have health insurance, and CPR and first aid certification. Participants will be expected to show proof of both after acceptance to the program. Participants should plan to study basic medical terminology and verbs in Spanish before arrival. Beginner to intermediate knowledge of Spanish is preferred (but not mandatory). If a participant cannot speak Spanish, we suggest that he or she enrolls in our Spanish language program as it will make their stay and experience more rewarding for both the participant as well as the professionals at the hospital. Participants must have a desire to learn and gain experience in the medical field. Participants should be proactive, hardworking, dedicated, respectful, professional, open-minded, eager to learn, flexible, patient, and to possess a passion and love for medical care. Participants tasks vary greatly depending on their skills, experience, and studies. In some cases, participants will only be allowed to shadow, in others they will be allowed to interact with the patients. Participants will be expected to be be professional at all times as well as respectful and self-starters (able to recognize what needs to be done or who needs to be helped). participants will help with charts, vitals, shots, possibly assistance in ambulance rides, and much more. This is a hands-on position and we try to put participants in a position to learn through experience in a safe and professional atmosphere. participants will attend to patients varying needs All medical volunteers must bring scrubs and evidence of their level of education and experience. Participants have the option to either stay with well-screened host families or at our headquarters which offers group housing. The accommodations depend predominantly on availability. Both accommodations offer safe living quarters with running water, electricity, and a shared bathroom. Host families do not always have wifi/cable, but do offer running water and electricity which typically is readily available. Participants staying at the program headquarters can expect apartment-style housing with access to their own kitchen, shared rooms and bathrooms, Wi-Fi, television/cable, and optional A/C and laundry service. Participants additionally will be living on-site for Spanish classes, weekly meetings, and local community development opportunities. Participants receive three light meals per day at either accommodation.